Shane Cohen, top, of Lower Moreland and Jack Elliott of Holy Ghost Prep scramble for a loose ball in the 2nd quarter on Jan 16, 2018. As the lone senior on the Holy Ghost Prep basketball team, Jack Elliott focuses heavily on being a leader and hustler more than a major scorer. "Usually, we have at least two or three seniors," longtime Firebirds coach Tony Chapman said. "So with the situation we're in this season, it's important to have a team-oriented player like Jack." Jack Elliott, right, of Holy Ghost Prep goes up for a shot against Forrest Keys, left, of Lower Moreland in the 2nd half on Jan 16, 2018. Elliott's spirited and poised play, especially in the late going, helped Holy Ghost Prep slip past Lower Moreland, 47-46, in a taut Bicentennial Athletic League Independence Division contest Tuesday night in Bensalem. The 6-foot-3, 170-pound senior wing guard totaled six points, six rebounds, three assists, and two steals. He nailed a fourth-quarter three-pointer. "We've had an up-and-down season so far, so this is a nice win," Elliott said. "We're hoping it can be a turning point for us." 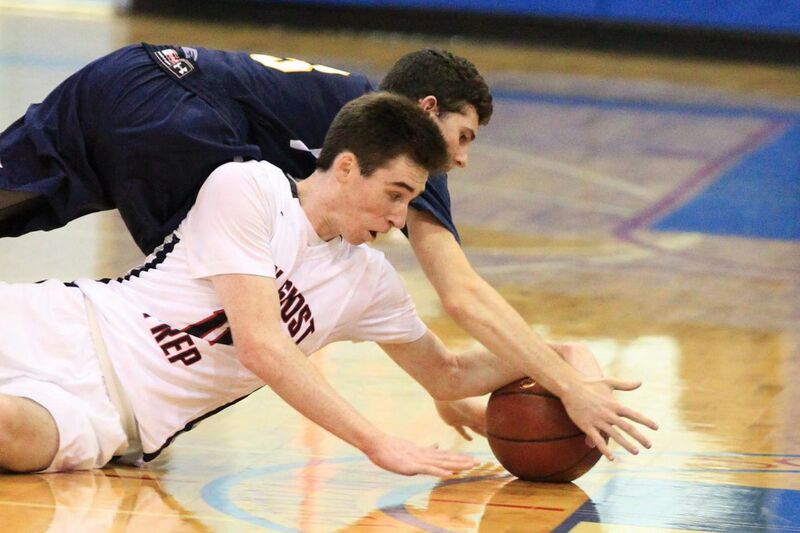 The difference was junior forward Jack Rittenmeyer's 12-foot, left-elbow jumper with 16 seconds remaining. The Lions took a flurry of up-close shots in the closing seconds but came up empty. Rittenmeyer's winner was set up after Elliott's driving shot along the baseline missed and the ball was tipped out to Rittenmeyer near the foul line. "He took the shot right away," Elliott said. "That's the kind of player he is. He's never afraid to shoot." Holy Ghost players rush to Jack Rittenmeyer, left, at the end of the game. Rittenmeyer hit the winning shot in their 47-46 victory over Lower Moreland on Jan 16, 2018. The Firebirds overcame 19 turnovers (14 in the middle two quarters) to improve to 7-7 overall and 6-3 in conference action. They trailed, 39-33, early in the fourth stanza. "We talk about having no more than 10 turnovers in a game," Chapman said. "I never thought we would have a chance to win if we were going to give up the ball up that many times." Elliott's sophomore brother, Sean, is a 6-4 reserve forward. He converted a pair of third-quarter free throws. Another Elliott, Ryan, is Sean's twin and a guard on Holy Ghost's junior varsity squad. The three played CYO ball for St. Ignatius of Antioch in Yardley. Rittenmeyer chipped in 13 points, including three treys, and five boards against Lower Moreland; junior floor general Greg Sylvester posted nine points and three steals; and 6-5 junior forward Greg Calvin collected eight boards (seven in the first quarter) and six points. Junior guard Shane Cohen paced the first-place Lions (11-3, 8-1) with 13 points, five boards, five steals, and three assists. "He's certainly the go-to guy for them, but you can't just concentrate on him," Chapman said. Jack Elliott, a second-year starter who is a high achiever in the classroom, plans to major in accounting in college. He is considering Lehigh, North Carolina, and Wake Forest. LM: Shane Cohen 13, Andrew Finnegan 3, Bryce Horn 10, Forrest Keys 12, Dan Shimon 6, Jordan Zoubroulis 2. HG: Greg Sylvester 9, Jack Elliott 6, Sean Sylvester 7, Greg Calvin 6, Jack Rittenmeyer 13, Sean Elliott 2, Tyler Mish 2, Kevin Morrison 2. Jack Rittenmeyer, center, of Holy Ghost Prep is congratulated by Greg Calvin, left, and Greg Sylvester after hitting the winning shot in their 47-46 victory over Lower Moreland on Jan 16, 2018.